Within its mission of remaining relevant and adapting to the current economic and legal climate, Bala Vikasa is establishing the flagship institution Vikasa International Center in Hyderabad with the belief that business has a crucial role to play in sustainable and community driven development. When up and running, the center will provide a platform for mutually enriching partnerships between corporates, entrepreneurs, institutions and communities. Its mission will be two-pronged, to harness vibrant entrepreneurial spirit and foster its growth, while promoting business responsibility and effective partnerships between companies and communities. The 20-acre campus is situated a kilometer off the Outer Ring Road in the upcoming Information Technology Investment Region, Hyderabad, Andhra Pradesh. 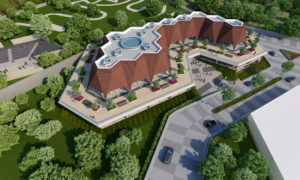 With a beautiful lake view and surrounded by rocky outcrops, the Center is envisioned to be a green and environmentally friendly establishment. It will have a residential capacity of 200 and be able to host up to 600 training participants at any one time. A fully equipped, modern Multimedia Unit will be set up to cater to the audio-visual production needs of corporate clients and entrepreneurs to support their development initiatives. Social entrepreneurship has been a familiar concept in India for a long time, but the concept of social business is a new phenomenon. Now, social enterprises are also known as ‘fourth generation hybrid enterprises’, offering the potential to transform lives while answering issues of poverty, inequality and environmental challenges. They are scalable, replicable and have the ability to create larger social impact in building sustainable communities. Bala Vikasa facilitates the strengthening of this sector through capacity building, incubation and industry linkages. Business in India is increasingly being tied to social development, and Bala Vikasa is positioning itself as a key player in this new dynamic of the Indian development story. Social accountability, ethical business and sustainable development are very important for business success today. Companies are critically appraised by consumers, stakeholders, communities and government based on the demonstration of sustainability in their business performance. Bala Vikasa facilitates the process of helping businesses achieve sustainability, and contribute effectively to community development. HELP US BUILD THIS FACILITY.